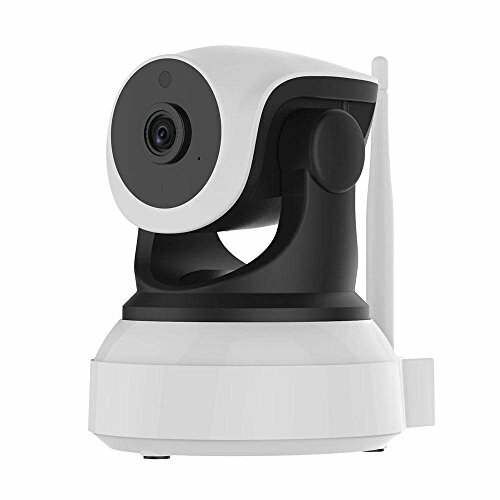 ★EASY to INSTALL: IP camera supports network cable or wireless installation. Quick respond code helps you get the operation App - EyeCloud and add camera promptly. Voice prompts and clear instruction show you how to set it up. ★CLEAR IMAGE & 2-WAY AUDIO: Security camera with built-in speaker and microphone, 720P bright HD image in daytime. Record clear black and white image even in total darkness. Night vision up to 32 feet. ★SMART MONITOR: Wide angle with 270°pan and 80°tilt. Monitor every corner of your home. Swipe right/left and scroll up /down on device screen to see different views. You can customized five most used sights as preset positions. The auto horizontal, vertical and preset auto cruise gives you hands - free experience. ★RELIABLE SECURE TECHNOLOGY: Advanced motion sensing technology. Alarm message will be sent to your mobile device upon detecting activity, click to get short video of detected motion. ★WARRANTY: If you run into any trouble about this product, please contact us firstly, our perfect customer service team to help you, thank you for your time. If you have any questions about this product by ZZY, contact us by completing and submitting the form below. If you are looking for a specif part number, please include it with your message.